The Regional Cooperation Council (RCC) officially marked on Thursday, in Sarajevo the beginning of its project dedicated to the development and promotion of tourism in the Western Balkans. 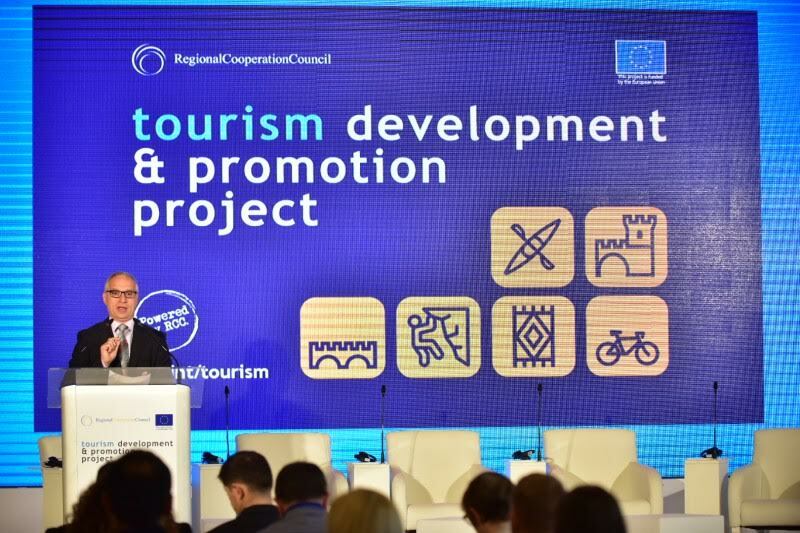 The project will help six Western Balkans economies to diversify and consolidate their cultural and adventure tourism products, build and promote a joint offer, which would be competitive on the international market and generate further revenues and jobs. The RCC’s Tourism Development and Promotion project is the result of priorities set by the region’s governments and the RCC’s efforts to operationalise them in order to contribute to the economic growth, employment and competitiveness of the region. “For us living in the region it is well known that our rich natural and cultural heritage potentials are underused. The six Western Balkans economies have made it their priority to utilise the tourism as a promising sector for economic growth. The RCC supports them to make use of its beauty and culture and open it to the world. This project is a novelty on the RCC’s agenda as it shifts our activities from policy development to targeted sector interventions, to prove that Regional Economic Area has a lot to offer, to the region and our future guests – adventure and cultural tourism seekers. In the next three years this RCC’s project will award up to 30 small grants worth about 50.000 euro each, in order to enhance infrastructure around adventure and culture tourism routes, with first calls for proposals to be published already in mid July this year”, said Goran Svilanović, Secretary General of the RCC. As RCC announced, this five million euro worth project is funded by the European Union (EU) and will be implemented by the RCC and its Project team in the next three years. Andrea Vera from the EU Delegation to Bosnia and Herzegovina expressed the pleasure over the start of the RCC’s Tourism Development & Promotion Project in the Western Balkans, adding that the Project fits with the EU Western Balkans Strategy and implementation of the Multi-Annual Action Plan for Regional Economic Area (MAP REA). “Being in Sarajevo Vijećnica here today makes me an enthusiastic supporter of this project, as this beautiful building was renovated with the EU funds. The region has a lot to offer – many great sites, crossroads of culture, and a lot of adventures. However, not all of them all easily accessible, which is exactly what this project is meant to do – to create regional routes with better infrastructure”, Vera emphasised. The project will include identification of the most viable joint cultural and adventure tourism routes, their development through a grant scheme in order to improve infrastructure and quality of services along the routes and a global promotion of the joint regional tourism offer and attractions. Project activities will be implemented in cooperation with the governments and private and non-governmental sectors in the six Western Balkan economies to attract greater number of tourists, lengthen their stay in the region and increase revenues and employment in the industry.